I don’t know about you but when I visit a garden and I see large fruits, I get excited! Well cucurbits such as Pumpkin and zucchini are offering this experience. They are producing large and numerous fruits under a rich foliage. I actually love to look around below the leaves to find the fruits. I feel like a kid at Easter day! They are large fruits and as we have developed it numerous times, they need a large variety of minerals and nutrients. This points make them unadapted to young aquaponics ecosystem as they would miss crucial elements and not develop properly. In a mature aquaponics system (6 months – 1year and more) they will grow very well and be very productive. The foliage is very generous and spread very widely. For this reason we will avoid to grow them in the centre of an aquaponics grow-bed. We will prefer to grow them in a corner where the roots will develop but the foliage will fall on the side of the grow-bed and leave the surface to other crop. Some species of cucurbits are very good climbers and can be grown in height. This technique will also help to leave the grow-bed surface available to other plants. Cucumber develop both male and female flowers. The female flowers must be fertilized in order to give fruits. In nature insects are going from one flower to the other which therefore fertilize it. Unfortunately with the number of insect decreasing significantly it is very frequent to find unfertilized female flowers. In some cities or in a closed greenhouse it is almost impossible to get natural fertilization. If you are in this case you will find some little baby cucumbers on the plant but they will not grow dry or rot after a few days. This is very typical and very frustrating for the gardeners who don’t understand what is going on. In this case we can artificially fertilize the flowers. To do so you can pick a little brush or tick and gently brush the centre of the male flower. Once done you can repeat this process on the female flower and the flower is fertilized. After few days you will notice the little fruit at the base of the flower will grow to form a nice cucumber. Watch out! The original plants can have a high level of a toxin called “cucurbitacins” so be careful if you produce your own seeds. The toxin taste bitter and is easy to detect so don’t eat your crop if you feel a bitter taste. How to grow zucchini in aquaponics: This is what we’re going to see together in this video. Before, subscribe to the channel and get the free gift from the description of the video just below or from the corner which is a free guide to help you to build your own aquaponics system and to manage your system in the best conditions. I am Jonathan from Melbourne Aquaponics, and my aim is to help you to grow sustainable, healthy, and tasty food in your own backyard, thanks to aquaponics. So today, we’re going to talk about zucchini in aquaponics. So zucchini is a fruit and they need a very wide range of nutrients to grow. So I made a special video previously about how to grow fruits in aquaponics, and I recommend you to watch this video because I explain to you that to grow fruits in aquaponics, we need to have a system that is mature, that you know when you start aquaponics, the system is young and so biodiversity in terms of bacteria but also insects is quite limited at the beginning, and it’s going to increase with time. And it’s the same as the nutrients available in the system for your fruit. So the more biodiversity you have and the more nutrients you have available for your plants. So zucchini is a plant that needs a very wide range of nutrients, and if you don’t have enough nutrients, it’s not going to be able to produce some nice fruits. So that’s the first thing to do is to make sure that your aquaponics system is at least six months to one year old to be able to grow fruits. Before that, I recommend you to add, to grow leafy vegetables such as spinach, lettuce, or those types of plants where you really eat the leaves. So once your system is mature enough, after one year or so, you can start to produce some fruit plants. So I’m talking about tomatoes, I’m talking about chilli, eggplants, and obviously, zucchini. So those types of plants, what I recommend to do you know, they normally take a lot of space. For example, the tomatoes you see behind me, the tomatoes I grow them in a vine and then I tried to grow them outside of the grow-bed so they don’t take all the space of the grow-bed. That’s the same technique we’re going to use for the zucchini. Zucchini, that’s a plant that is quite large. You see I got one here behind me. This plant is taking a lot of room. So if you plant it in the middle of your grow-bed, it’s going to take the whole grow-bed. And you are not going to be able to grow much else. So what I recommend doing is to grow them in the corner of the grow-bed and to let it fall on the side. In this case, it doesn’t take much surface in the grow-bed because you can plant all the other plants on the other side of the grow-bed, you know, in the middle, and this one is just going to have the roots in the corner of the grow-bed and then it’s going to fall on the side such as this. So you see it has access to a lot of light so it can grow a lot of fruit, but it doesn’t take much room in the actual grow-bed because otherwise, if you grow this in your grow-bed you will be very limited in terms of biodiversity, in terms of quantity of plants that you’re going to be able to grow in your grow-bed. Zucchini is a sexual plant. They got some flowers that are female and some flowers that are male, and in order to get fruits, you need to make sure that you got insects that are going to go into the male flower and then go into the female flower to fecundate the female. Unfortunately, depending on where you live, if you are in a city where there are not many insects, you may have some flowers that are not fecundated. So what I recommend to do is to do it yourself. So to fertilize the flower, you just have to take a little stick and you’re going to come and go around the male flower, take the substance that is important to fertilize the female, and once you cover your stick with this substance, you kind of go to the female flower and then you’re going to fecundate the female flower. So that’s very simple but that’s very important. If you don’t do that you are not going to have any fruit. So once the plant is fecundated, then it’s going to start to grow a very nice zucchini, and it’s very, very interesting to grow those types of fruits because they produce a lot. So if you have a very small system, aquaponics system and you still want to produce and feed your family, zucchini is a very good way to produce a significant quantity of food. So now, it’s your turn to grow zucchini at home. So in the comments, please let me know if you have started to grow zucchini already, if you have some experience, if you had success, or if it failed, please let me know your experience. You know, in this video, I talked about how to put zucchini in place, but in general, for fruits I made a video about it again, and I talk about how to make sure you got the good nutrients for the plants. I’m talking about minerals. I’m talking about nitrogen, but I’m also talking about the ions. That is very important. So watch the video about the fruits. Leave me your comments in the comments section of the video. Don’t forget to get the free training to build your own aquaponics system and to manage your aquaponics system in the best conditions from the description of this video just below or from the corner of the video. You’re going to find ‘I’ like ‘information.’ You can click on it and you can access this free training. It’s really a lot of good information to start aquaponics in the good base. So I hope you enjoyed the video and see you in the next one. Bye-bye. 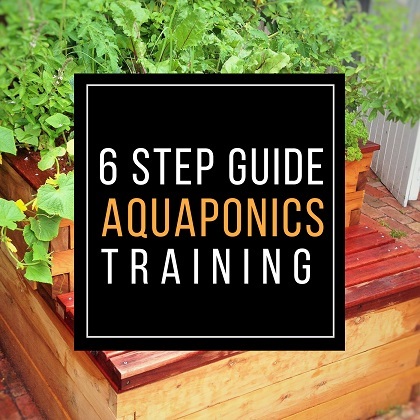 So once you get access to the free training, you will arrive to this page and here you will have a detail of different steps and each time you got a video or some description to really allow you to build some strong knowledge and to know and to learn the basics of aquaponics that will avoid any mistakes. So just enter your email address and you will receive access to this training. So if you are new to this channel, please subscribe. I’m going to release one video every week. Don’t forget to get your free gift from this screen. You can also leave me a comment below the video. Subscribe to the channel and see my last video. I really hope to see you soon, and I wish you a fantastic success with aquaponics. Have a good crop!